These hills are just north of the town of Boyle. They overlook Loughs Gara, Arrow and Key. The name has nothing to do with the bird, the curlew. This is merely an anglicisation of Ir. Corrshliabh. However, the precise meaning of the first element is unclear. The interpretation 'pointed mountain' offered by Flanagan & Flanagan does not fit the landscape at all. Joyce's 'rough or rugged mountain' is more plausible, but even this seems a bit exaggerated for these hills, which are rather gently rolling, especially in comparison to their immediate neighbours, the Bricklieve Mountains. An earlier name for this range is Sliabh Seaghsa. Segais is a legendary well of wisdom to which the goddess Boann was forbidden to go to. She defied this taboo, and to show her displeasure at the prohibition walked three times tuathal (anti-clockwise) around it. This ritual, often used in cursing, showed disrespect at least, and the water from the well rose up and chased her to the sea at Drogheda, thus forming the river named for her, the Boyne. On a point of geography, it should be noted that the real source of the Boyne is actually some way to the south-east near Carbury in Co. Kildare. Though the name Sliabh Seaghsa seems to have some relation to the Well of Segais, the Curlew Mountains are west of the River Shannon. Has been called Brislagh. Curlew Mountains is the third highest hill in the Bricklieve/Curlew area and the 1265th highest in Ireland. Curlew Mountains is the most southerly summit in the Bricklieve/Curlew area. Curlew Mountains is the third highest point in county Roscommon. 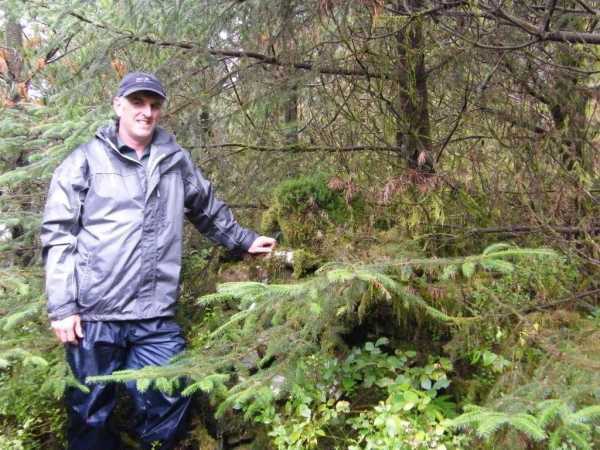 Picture from paddyhillsbagger : Brislagh/Curlew Mtn cairn in the forest? Picture: Brislagh/Curlew Mtn cairn in the forest? Well on my map the grid reference given is marked as Brislagh with Curlew Mtns in larger print spread out over the hills to the East. Taking a side road to the left of the R295 Boyle/Ballymote road we viewed the rather uninspiring tree covered hump of Brislagh. We eventually parked slightly beyond the apex of the road on a slight downhill at a layby with a break in the forest and a very rough path leading uphill to the right of the road at 746 046 A. We walked, or should that be stumbled up this path to it's top then turned right into a seemingly impenetrable bundle of fallen trees and brambles into the moss covered dark forest beyond. After about 10 mins of this we came upon a clearing which was no better underfoot but gave fine views to Kesh Corran and Bricklieve Mtn, both of which we had climbed earlier and both of which were still cloud covered. We re-entered the dark forest heading roughly North and up a noticable incline trying to find anything that could be called the "top" amidst the trees. After about 15 minutes somewhere in the forest we believed we had reached a crest as a downhill was noticed to our left and a slight slope down in front of us. We then stumbled upon a small stone wall and a larger stone pillar covered in moss, surrounded by trees. Is this Brislagh cairn? It's not marked on my map but the small hill to the West of here (Derrinoghran) visible from the road and treeless has a noticable cairn also not marked. Can anyone verify this? Pleased with ourselves and jolly from finding what we claimed to be the top we made the hill walkers mistake of not taking a compass reading before descending and consequently ended up going round in circles in the forest! The compass duly came out and was used when we realised our errant ways and eventually we retraced our route back to the car.